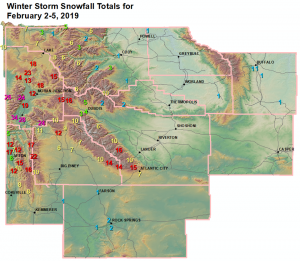 One of the heaviest snowfalls of the season is wrapping up across Western Wyoming. 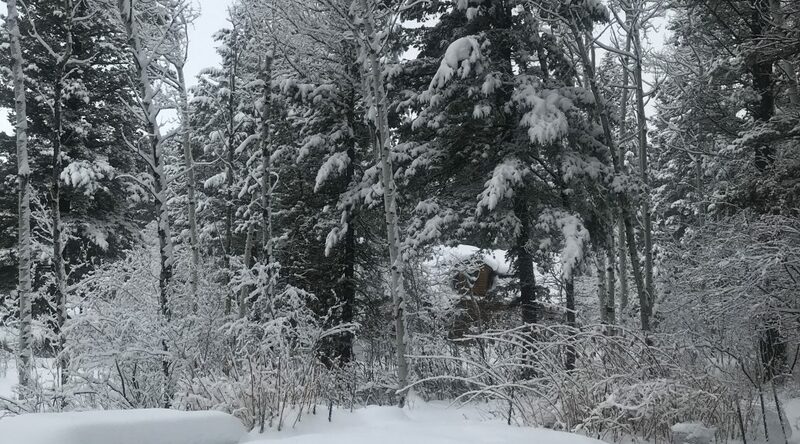 Teton County was hardest hit with from 2 to nearly 4 feet of snow. Much of Star Valley measured from 10-16 inches with higher totals in the Salt Range. Deer Park Snotel...                 23 inches. Hobbs Park Snotel...                16 inches. South Pass Snotel...                15 inches. St. Lawrence Alt Snotel...          10 inches. Townsend Creek Snotel...            10 inches. Cold Springs Snotel...               6 inches. Burroughs Creek Snotel...            5 inches. Castle Creek Snotel...               2 inches. 6 SW Lander...                     0.3 inches. Owl Creek Snotel...                  2 inches. 13 SSE Buffalo...                  0.5 inches. 4 SSW Buffalo...                   0.5 inches. 17 E Kaycee...                     0.5 inches. Blind Bull Summit Snotel...         17 inches. Blind Bull Summit...                17 inches. 2 SE Thayne...                    16.7 inches. Spring Creek Divide Snotel...       16 inches. Cottonwood Creek Snotel...          15 inches. Box Y Ranch...                      13 inches. 5 NNE Thayne...                   12.5 inches. Star Valley Ranch...              12.2 inches. Willow Creek Snotel...              12 inches. Salt River Summit Snotel...         12 inches. Indian Creek Snotel...              10 inches. 5 SSE Smoot...                     9.5 inches. Kelley Ranger Station Snotel...      8 inches. Hams Fork Snotel...                  8 inches. 3 SE Bedford...                      7 inches. 3 S Fontenelle Dam...                1 inch. Younts Peak Snotel...                6 inches. Beartooth Lake Snotel...             6 inches. 26 SW Cody...                      1.5 inches. 3 NE Sunshine...                   0.7 inches. 2 WSW Cody...                      0.5 inches. 4 ENE Powell...                    0.4 inches. 4 SW Powell...                     0.3 inches. Triple Peak Snotel...               22 inches. Big Sandy Opening Snotel...         14 inches. Larsen Creek Snotel...              14 inches. Loomis Park Snotel...               12 inches. East Rim Divide Snotel...           10 inches. Pocket Creek Snotel...              10 inches. Snider Basin Snotel...              10 inches. Gunsite Pass Snotel...              10 inches. New Fork Lake Snotel...             10 inches. Kendall Ranger Station Snotel...     9 inches. 14 NW Pinedale...                    7 inches. Elkhart Park G.S. Snotel...          7 inches. Daniel Fish Hatchery...              6 inches. 4 NNW Rock Springs...              1.7 inches. 2 NNE Farson...                    0.5 inches. Jackson Hole - Rendezvous Bowl...   43 inches. Jackson Hole - Raymer...            42 inches. 1 ENE Teton Village...            38.5 inches. Jackson Hole - Mid Mountain...      38 inches. Phillips Bench Snotel...            34 inches. 3 SSW Wilson...                     34 inches. 5 NW Jackson...                   32.5 inches. Jackson Hole - Base...              29 inches. Grand Targhee - Chief Joseph...     26 inches. Grand Targhee Snotel...             24 inches. Granite Creek Snotel...             24 inches. 6 NW Moose...                       24 inches. Base Camp Snotel...                 18 inches. Togwotee Pass Snotel...             15 inches. Grassy Lake Snotel...               14 inches. Snake River Stn Snotel...           13 inches. Togwotee Mountain Lodge...          12 inches. Gros Ventre Summit Snotel...        10 inches. 1 NNW Alta...                        8 inches. 16 SSE Ten Sleep...                0.5 inches. Lewis Lake Divide Snotel...         23 inches. Snake River Ranger Station...     19.6 inches. Thumb Divide Snotel...              18 inches. Two Ocean Plateau Snotel...         15 inches. Yellowstone East Entrance...         9 inches. Sylvan Lake Snotel...                8 inches. Sylvan Road Snotel...                6 inches. Parker Peak Snotel...                6 inches. Tower Falls Ranger Station...      3.1 inches. Lamar Ranger Station...            1.1 inches.